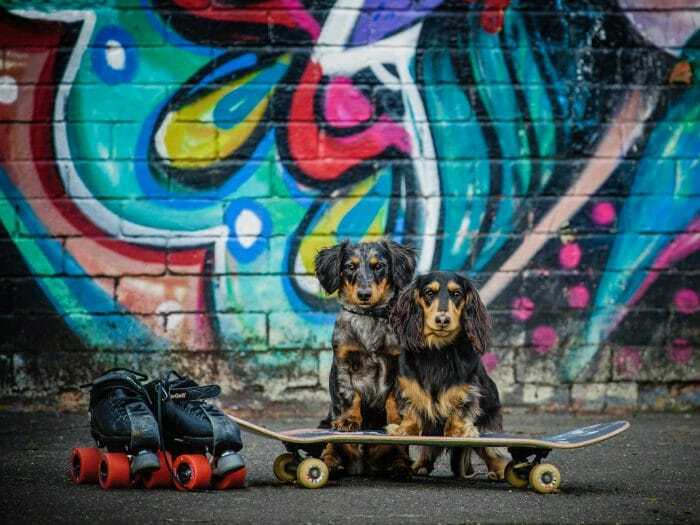 Creating Magical Moments with Melbourne’s Top Dog/Pet Photographers! This lovely family travelled quite a distance for their PAWtraits session with their Furry babies and oh we had so much fun. Before this session, we were warned that their furry kids never sit still, so “good luck, there is no way they will sit or listen to commands”. Maybe it was the magical dust, we sprinkle before the photo session but this family were a gem to photograph in our unique Outdoor Studio in Northcote, Melbourne. With a range of ages and training levels, Toby, Maltese Terrier (13 years), Bella, Maltese x shitzu (5 years), Ellie, Maltese x shitzu (3 years) and Gypsie, mini foxy (14 weeks). Loved being photographed and were very responsive. Owners – Leann and Clayton did great too! The unconditional love people have for their pets is just such a pleasure to photograph, we also love a challenge! They are our life, our babies. They have such big personalities. Leann and Clayton. Honest truth to how we get the results we do! Maybe the magical dust played apart, but the honest truth to how we get the results we do is because for a majority of our photos sessions, we have two professional photographers participating. One to photograph, concentrate on framing and capturing the decisive moments that make an incredible image. The other to help you to look your best and achieve the best expressions from your family/pets. This is a rarity, as most photographers work alone. Over the years, we have heard many times, your photos just have that something extra, they look “alive”, “we can feel the love”. It is our firm belief it is due to this combination of skills, experience and talents. By doing this, we capture the best memories for your family. 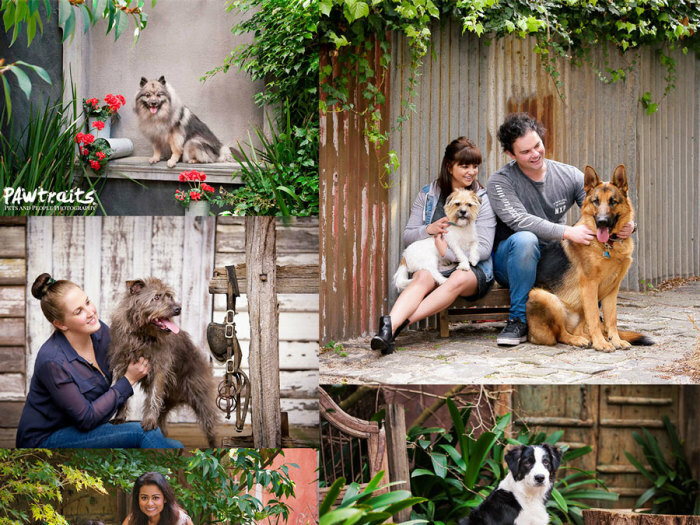 Our Outdoor Studio in Northcote, Melbourne is one of our most requested locations for our PAWtraits Session. It’s been custom built with photography in mind. Multiple rustic backdrops at every turn, there is always something for everyone, no matter the time of day. Our Outdoor Studio is safe for your furry kids to be free to roam as it is fully fenced and secure. Due to this we find that most dogs are happier off lead and still responsive to our crazy noises and treat distribution ways. We used multiple backdrops and props available in our Outdoor Studio during this session (this blog includes just a few). We even got the fur kids enjoying a bubble bath together!! 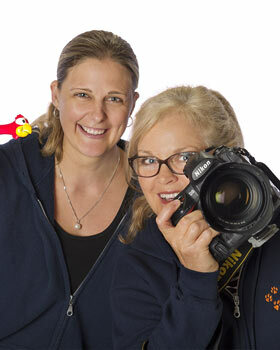 If you have been thinking of getting your pets and family photographed, Now is a great time! Don’t stress that they are not perfectly trained, let us sprinkle our magical dust and see what we can create. Mother’s Day is just weeks away and what better way to celebrate. Surprise her with a PAWtraits session – Gift vouchers available today! Our Gift Vouchers can be purchased online (at our parent company) or we would love to chat to you about an up and coming session. Hi, Julie and Tracy are our names. We love pets and animals of all kinds and understand just how much they are a part of the family. We love to focus on the special bond between you and your pets. With over 20 years experience in Portrait photography we will make sure you and all your family (including your furry, feathered and scaly friends) look fabulous. We look forward to chatting about your "best friend/s" and capturing PAWsome PAWtraits for you soon! Copyrights 2018 Lifeworks Photography. All Rights Reserved.